'It Just Hurts,' Alton Sterling's Aunt Says Of Baton Rouge Officers Not Facing Federal Charges : The Two-Way "All of this was for nothing, but it just hurts so bad," Sandra Sterling, Alton Sterling's aunt, says of news that the Justice Department won't prosecute two officers involved in her nephew's death. 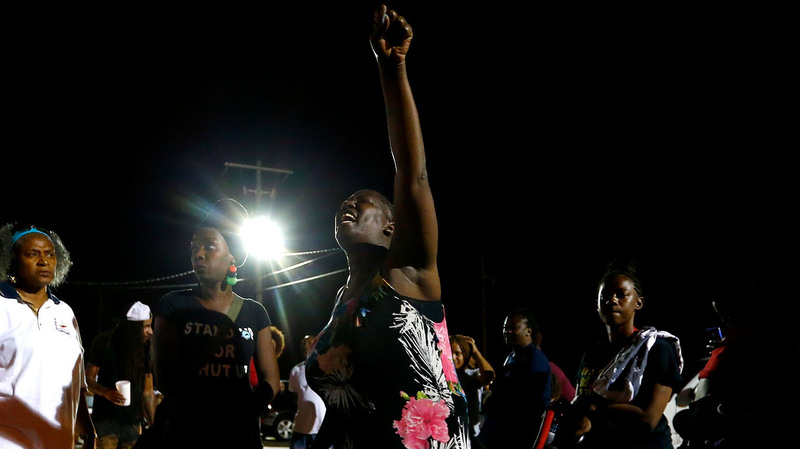 Veda Washington-Abusaleh attends a vigil Tuesday night for her nephew Alton Sterling, who was shot by police last July in Baton Rouge, La. The Justice Department says it is closing its ten-month investigation into two Baton Rouge, La., police officers involved in the shooting death of Alton Sterling last summer. The investigation found "insufficient evidence" for federal criminal charges against the police. Video footage of the killing showed the officers, who are white, holding Sterling, who is black, on the ground, where he was shot multiple times. The incident prompted protests and a federal inquiry. The department announced its decision not to prosecute Baton Rouge Police Department officers Blane Salamoni and Howie Lake at a news conference in Baton Rouge Wednesday afternoon, a day after the decision leaked to national news outlets. Louisiana Attorney General Jeff Landry could still file state charges, but he hasn't disclosed his plans. The federal investigators said at a press conference today that there "will be a state investigation to follow." Justice Department officials said they met with Sterling's family before the official announcement. Family members had earlier expressed frustration at the decision, and about how they first found out about it initially through media reports. Veda Washington-Abusaleh, one of Sterling's aunts, said "the lawyers called and said they have not made a decision," Washington-Abusaleh said at last night's rally, according to The Times-Picayune. "Ain't that something? But the Washington Post called us here at [Baton Rouge area code] 225." She added, "We need closure, we need a conviction. We need justice." Sandra Sterling, the aunt who raised Alton Sterling after his mother died, told local TV station WBRZ that the Justice Department decision stings — particularly after she and her relatives had been assured it would be worth the wait to ensure justice was achieved. "No, it's not worth the wait, it's not worth the wait," Sterling told the station. "All of this was for nothing, but it just hurts so bad." News that no federal charges would be filed was first reported by The Washington Post Tuesday afternoon; ABC News later said it had also received word about the decision from federal sources. In anticipation of the Justice Department making its decision public, more than 100 people gathered Tuesday night for a vigil at the Triple S Food Mart where Sterling was shot last July. People on different sides of the issue had not been expecting the DOJ to file charges, Bryn Stole of local newspaper The Advocate tells NPR. "But," he adds, "there were a lot of people who were really upset over the way it was handled, and the way it was leaked to the [Post]." The way this process has unfolded has also riled local officials. Both Louisiana's governor and Baton Rouge's mayor said that they hadn't been told of a decision. "You can imagine how Alton Sterling's family felt reading that and getting a media alert on their phones about it. And so that was very disheartening and unsettling for this entire community and of course for me as well," Baton Rouge Mayor Sharon Weston Broome told NPR's Kelly McEvers. Sterling, 37, was shot to death after police were called to a convenience store for a disturbance and a man who had reportedly made a threat with a gun. The intense scene that followed was captured on video from at least two vantage points, showing one of the officers who were holding Sterling down on the asphalt yelling, "He's got a gun! Gun!" seconds before the shooting. The owner of the Triple S store, Abdullah Muflahi, told The Advocate that the officers retrieved a gun from Sterling's pocket — but, Muflahi said, he didn't see Sterling's hands go near his pockets during the struggle. Muflahi also said Sterling had been selling CDs outside his store for several years. Salamoni, a four-year veteran of the force, and Howie Lake II, a three-year veteran, were placed on administrative leave after the shooting. Much of the focus of the investigation surrounded whether Sterling was actually reaching for a gun when Salamoni said he was "going for the gun" and fired shots into his chest. In a press release, the federal prosecutors said Sterling's right hand is not visible in video footage, and the investigators conclude that the evidence "simply cannot establish beyond a reasonable doubt the position of Sterling's right hand at the exact time of the shooting, a split-second later." "In light of the officers' explanations of the shooting, the government, in order to prove a Fourth Amendment violation, would be required to (1) disprove the officers' accounts, (2) prove an alternative account that demonstrates that the officers' actions were objectively unreasonable; and (3) prove that the officers knew that their actions were unreasonable and took them anyway." With that bar in mind, the prosecutors said: "In order to prosecute this matter, the government would have to prove beyond a reasonable doubt not only that Sterling was not reaching for his gun but also that, despite Officer Salamoni's contemporaneous statements to the contrary, he did not believe that Sterling was reaching for his gun after being warned not to move. The Department lacks the evidence to prove either of those propositions beyond a reasonable doubt." Unlike in other police shootings, local, state and federal authorities did not make parallel inquiries into Sterling's killing. After Baton Rouge Police Chief Carl Dabadie's department carried out an initial investigation, he turned the entire case over to the FBI and U.S. attorneys. The local district attorney also left the case up to the Justice Department. At last night's vigil, Baton Rouge resident Kayla Washington told reporter Travis Lux of member station WWNO that she was there to support the family. Lux says she also told him the Sterling case has hung like a cloud over Baton Rouge. Mayor Broome said residents are very concerned about justice and she anticipated peaceful protests. "But I will also say that folks want to believe that justice is attainable as well, and so we all have to be focused on justice and equity being a standard here in our community - and not only here in our community but throughout this nation as well," she said.